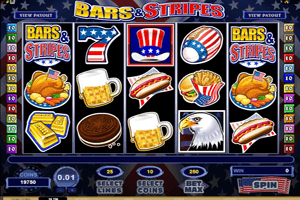 Bars and Stripes is a video slot machine that is all about America, which is not a surprise since the game is called Bars and Stripes. Once players open up the game, they will quickly realize that the theme of the game does not only affect the name of the game as it affects all of the aspects, the visuals and the symbols of the slot machine. The game is offered to players in five reels and a total of 25 lines that they can place any wagers on. These wagers can be placed under the reels by going through the different wagering options that the game has to offer them. Play Bars and Stripes Slot here. The symbols include Oreos, beer, the American flag, hot dog, American bald eagle, an apple pie, Uncle Sam’s red, white and blue hat, a seven that is covered with the US flag, thanksgiving turkey, burger and fries, a golden bar and the statue of liberty. Uncle Sam’s hat is the scatter bonus icon of Bars and Stripes. This symbol has the ability to trigger the Bonus Hats bonus in which players will pick hats on the screen to reveal the prizes they have. This happens when players get least 3 scatters on the reels, they can claim up to 375,000 coins. The Bars and Stripes logo of the game is wild and it can substitute for any other standard symbols while doubling any payouts that it contributes in creating on the lines of the game.